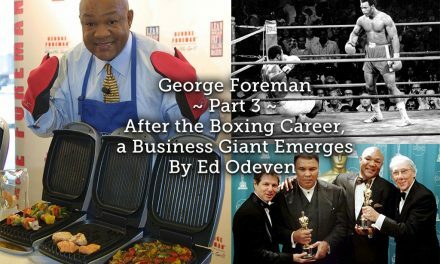 When he was presumably closer to retirement home age than prime-time sports figure, George Foreman produced one of the most stunning feats in modern sports history. By becoming heavyweight champion for the second time, Foreman ensured a more prominent place for himself in the annals of the sport — nearly two full decades after going toe-to-toe with Joe Frazier (dropping the legend six times in two rounds in 1973 in Kingston, Jamaica, to become title holder) and then challenger Muhammad Ali (losing via an eighth-round KO in the Rumble in the Jungle on Oct. 30, 1974, in Kinshasa, Zaire). 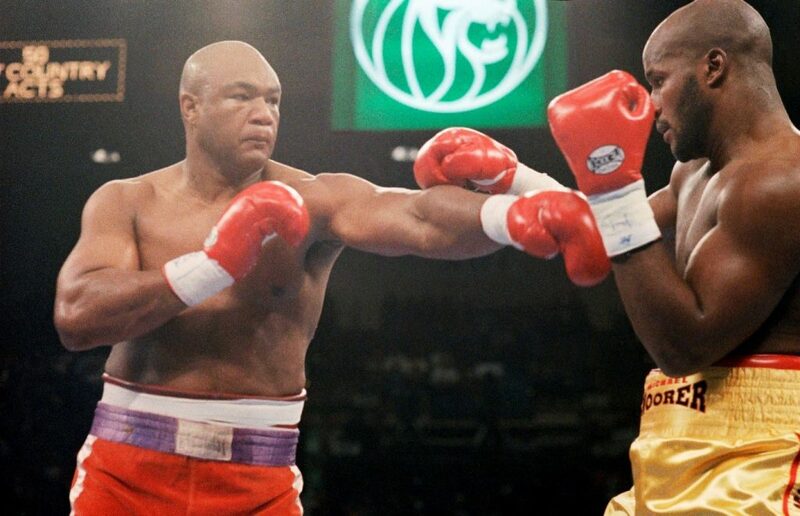 In a recent interview, Foreman, now 69, analyzed what happened inside the squared circle against Moorer, who was 27 at the time. He also spoke in detail about his two fights in Japan, which took place 23 years apart and nearly bookended a legendary career. Against Moorer, Foreman believes that he outsmarted the New York City native, and that his strategy was superior. In other words, the strategy to exhibit patience with Moorer, a former light heavyweight champion, was spot-on. Nearly a quarter century after Foreman recaptured the world heavyweight title — the WBA and IBF versions — in the confusing alphabet-soup organizational landscape of pro boxing — he credited Moorer for demonstrating bravery in their mano a mano clash. “He didn’t run from me, he didn’t hide,” Foreman said of Moorer. 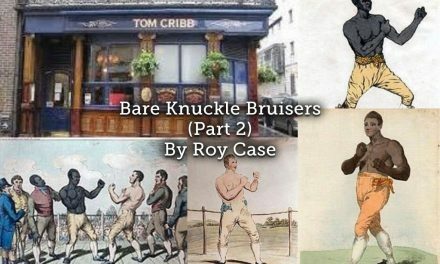 There remains, however, a misconception that has been published in various articles about the knockout artist’s attire for the Moorer fight, he said. Given the chance to set the record straight, Foreman said he didn’t wear the same trunks against Moorer that he had donned for the Rumble in the Jungle. 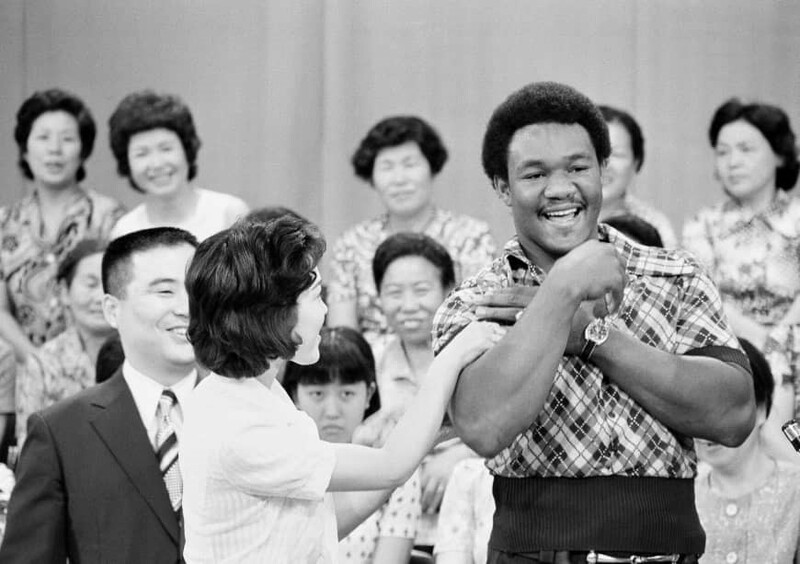 Foreman, the 1968 Olympic heavyweight champion in Mexico City, retains vivid memories of his first fight in Japan. He defended his WBA and WBC titles on Sept. 1, 1973, at Nippon Budokan against Puerto Rican challenger Jose Roman. The beatdown lasted exactly two minutes for the new world champ. Truth be told, Foreman didn’t follow that advice against Roman, who was appearing in his 52nd pro fight. 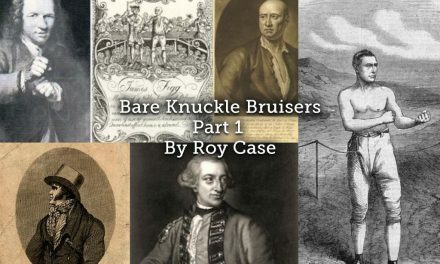 But his punches produced the desired results. How was Roman’s condition afterward? 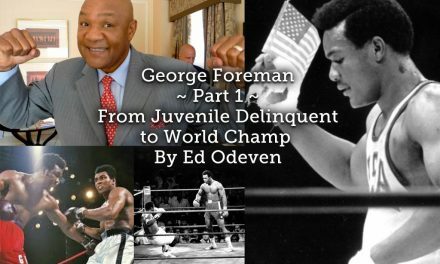 “He recovered good because the good thing about my punches is it’s not like the boxers who have to hit a guy a hundred times,” Foreman stated. “If I threw five shots and hit a guy once, it was gonna knock him down. Against Roman, Foreman believes that he delivered those blows like a sledgehammer. Powerful words from a fighter who recorded 68 — count ’em 68 — knockout victories in 76 pro bouts. 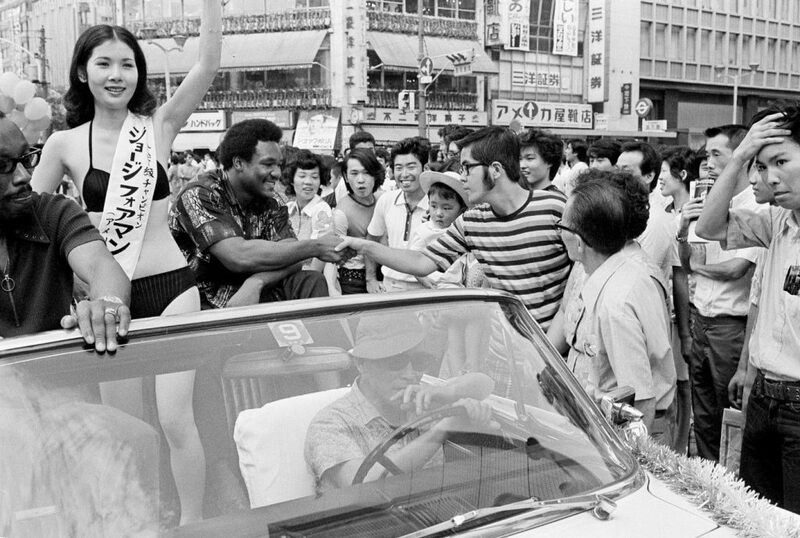 Heavyweight champion George Foreman shakes hands with a Tokyo resident during a parade through Ginza in 1973 ahead of his title bout with Jose Roman. Foreman donated $10,000 from his Roman fight earnings to a home for handicapped children in Japan, according to news reports at the time. He couldn’t recall the name of the home, which didn’t appear in 1973 articles. Asked if he had visited that home, Foreman said that he didn’t. But he stopped by other homes that supported children in need in the years that followed. Learning about Japan’s recovery from World War II from afar, as well as from earthquakes and other natural disasters over the years, including the Great East Japan Earthquake on March 11, 2011, Foreman paid tribute to the character of this nation’s people. “You’ve got to understand that the people in Japan are the most resilient people in the whole world,” Foreman said. Foreman estimates he’s made five visits to Japan over the years for work and leisure, including as a cast member of “Better Late Than Never,” a TV reality-travel program (and remake of the popular South Korean show “Grandpas Over Flowers” that also featured actors William Shatner and Henry Winkler, NFL Hall of Fame quarterback Terry Bradshaw and comedian Jeff Dye. In August 2015, production work began for the show in Japan. Season 1 aired in 2016 on American TV network NBC and included stops in Tokyo and Kyoto, among other locales in Japan and East Asia. The show’s concept was straight forward: “The stars will travel around the world, experience new cultures and take another step in checking off their bucket lists,” The Korea Times reported. Besides work for the TV show, Foreman was able to see Japan up close like he’d never done before. It was Grimsley’s first loss in 21 career fights up to that day. 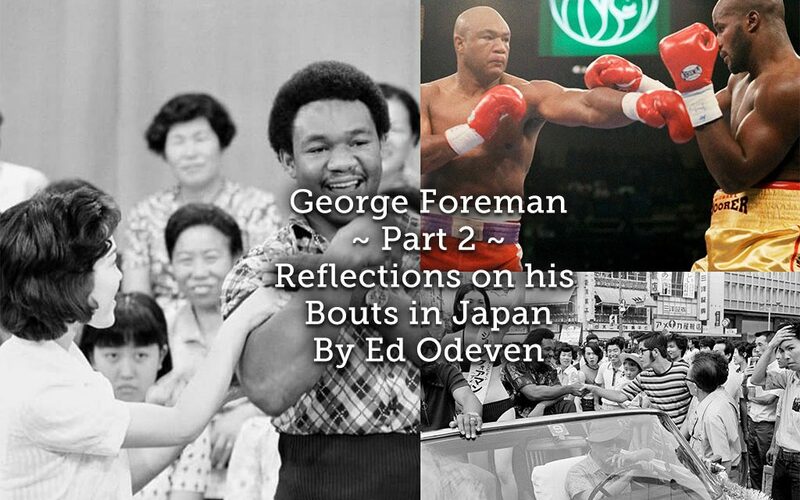 Foreman fought twice more before retiring for good. Angelo Dundee, Ali’s legendary trainer (1960-81), worked in Foreman’s corner. “Some good-mannered people, more so than some people. I could’ve had the same fight in upstate New York and everybody would’ve been cussing and throwing stuff,” he added with a laugh. What’s more, the day of the fight provided an unexpected, memorable experience for Foreman: He met MLB superstar Barry Bonds for the first time. “He came up into the ring and shook my hand. That was the highlight of the whole fight for me,” said Foreman, who described Evander Holyfield and Ali as the smartest boxers he ever faced. Ed covers primarily basketball for The Japan Times. 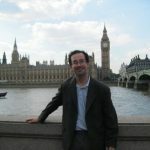 He reported on a wide range of sports from the 2008 Beijing Olympics and 2012 London Summer Games for this newspaper. A native of the Bronx, N.Y., Ed is a graduate of Arizona State University. He previously worked for the Arizona Daily Sun in Flagstaff, Ariz., reporting on high school, collegiate, professional and Olympic sports (Flagstaff is a major international Olympic training site due to its high elevation) and writing a weekly column. His articles have appeared in Venezuela Online News, The Gleaner (Jamaica), the Monitor (Uganda), The Moscow Times, Swimming World Magazine and numerous other publications.